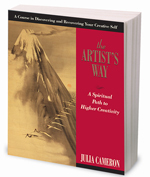 Tarcher/Penguin is celebrating the continued success of Julia Cameron’sThe Artist’s Way by presenting the Seeking the Next Top Artist Writing Contest. The top prize is $5,000 and a manuscript review by a Penguin editor. Julia Cameron will select the winning entry from among 10 semi-finalists. Writers residing in the USA are invited to submit an unpublished novel, novella-length fiction, or a work of narrative nonfiction. (Limit one entry per person.) Entry is free. For complete rules and entry information, click Tarcher. Entry deadline is March 2, 2012. Now I really need to kick it into high gear! !